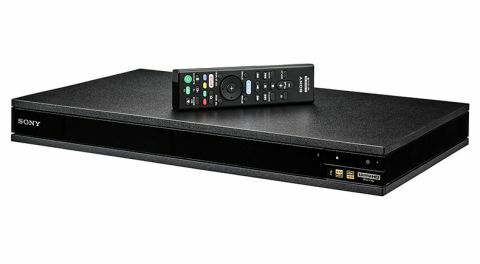 Sony UBP-X800 4K Blu-ray player review | What Hi-Fi? Doing something for the first time can often be nerve-wracking. Bungee-jumping, for example, or going on a date. And making a success of it is even harder, as you venture forth into uncharted territory. No doubt Sony had similar feelings with the release of the UBP-X800, the company's first 4K Blu-ray player. But it can rest easy; the X800 is a definite success. So, let’s start with the ‘things a good 4K Blu-ray player should do’ checklist. First up: colour. We feed the X800 a copy of the 4K HDR documentary Planet Earth II, and the vibrancy of the colour immediately hits us. The azure skyline pops against the white of the snow-capped Himalayas without appearing oversaturated, and the subtle hue differences in the fur of the wild cats are nuanced and natural. So far, so good. The X800 certainly makes the most of the number of pixels it has to play with, too. As well as being coloured nicely, the mountain cats’ fur is layered and crisp. You can also make out more detail in the rocky terrain, little cracks or rock fragments that other players don’t pick up. Planet Earth II features lots of long pans over vast landscapes, and even in the distance you can see the faint indications of slopes and sharp angles even under the blanket of snow. Pleasingly, it fares well during dark scenes too. We stream a few hours of Charlie Brooker’s Black Mirror on Netflix and, during the episode Playtest, the detail and range of blacks in the grotesque spider-creature’s hair helps make the distinction between hologram and reality all the more blurred. While the XB800 supports HDR10, it's worth noting that Dolby Vision doesn't feature on its list of supported HDR formats and, speaking to Sony, it's unlikely to in the future. Granted, this particular flavour of HDR is in its infancy (you can count the number of Dolby Vision 4K Blu-ray discs on one hand) and you still need a compatible 4K TV to reap the benefits, but it's something to bear in mind. Moving down a level in terms of resolution, we load a Blu-ray of Guardians of the Galaxy. There is a good degree of dimensionality to the image, so when Starlord, Gamora and Rocket Raccoon are planning their escape from the Kyln prison ship, with Groot reaching for the battery behind them, the difference between the foreground and background is impressive, due to the sophisticated way the Sony UBP-X800 renders the small details in outlines. You won’t have to worry about the quality of the upscaling with this player. But when their best-laid plans go south and the superheroes are forced to improvise, the X800 has no trouble moving from stationary planning to a guns-blazing battle. Star-Lord’s leaps and rolls over tables, Drax’s burly punches, and Rocket’s frantic scrabbling to escape the bullets are all kept smooth and realistic (or as realistic as a film with talking animals and God-like villains can be). The video quality is matched by crisp audio quality too. We connect up the X800 to a Yamaha RX-A3060 amplifier and our PMC Twenty5.23 speaker set-up, and find a light, insightful character to the player that outshines its main competitor, the Panasonic DMP-UB900. We play Fantastic Beasts and Where To Find Them, and when Eddie Redmayne’s Newt Scamander catches the magical, coin-spluttering Niffler (a platypus-type creature) the clatter of gold coins falling to the floor has a shine to it that, while never verging on bright, adds a little bit of sparkle to the sound. Effects such as the hatching of a monster egg are sharp and snappy, and stand out against the soundtrack. It’s well organised, with each sound effect having its own clear, well-defined space. And while it has no trouble with large-scale sounds, it really comes through in its low-level dynamics. During the film’s second scene, in which muggle Jacob Kowalski goes to the bank, offering pastries to try and alleviate his financial woes, the emotion in both the bank manager’s steely refusal and Kowalski’s disappointing whisper is really quite expressive. The same can be said while playing a Blu-ray of Stevie Wonder: Live At Last; this player's sense of timing in Superstition will easily get your foot tapping as the rapid trumpets bash out an infectious rhythm. There's an openness to Wonder's vocals as his voice naturally strains, building up to the chorus. When it finally gets there the X800 delivers a huge sense of energy and dynamism - the player refuses to shy away from a challenge. MORE: Dolby Atmos: What is it? How you can get it? Setting up the Sony UBP-X800 couldn’t be easier. The remote is well-sized, the buttons feel nice, and the dedicated ‘Net Service’ button – which takes you to the last used app – means that non-Netflix subscribers have a button for their most used streaming service too. If you are a Netflix subscriber, you have your own dedicated button. The X800 comes with the expected support of Netflix and Amazon Video, as well as BBC iPlayer, Demand 5, Spotify and an array of other options. While it’s not a complete list – ITV Hub and All4 are missing – those with a 4K HDR television will most likely find the full range of services available through their TV. You can also stream your Android smartphone to the player via Miracast, and if you’re among the dwindling numbers of people with a 3D television, the X800 plays 3D movies too. SACD playback is also supported. There’s also a USB input for video and audio, hidden underneath a panel on the right-hand side of the player. Much like other Sony players, you can connect it wirelessly to other compatible speakers via its SonyPal app, or stream the audio through Bluetooth to some wireless speakers if you don’t want to disturb others with the noise from your TV. Twin HDMI outputs give you the option of sending audio to your sound system and feeding a picture into a projector. If you’re in the market for a quality 4K Blu-ray player, this is the one we’d recommend. It’s got a crisp, detailed, and colourful image, sounds great, and is simple to use. The X800 has certainly met Sony’s high standard – and set a high standard for its competition.